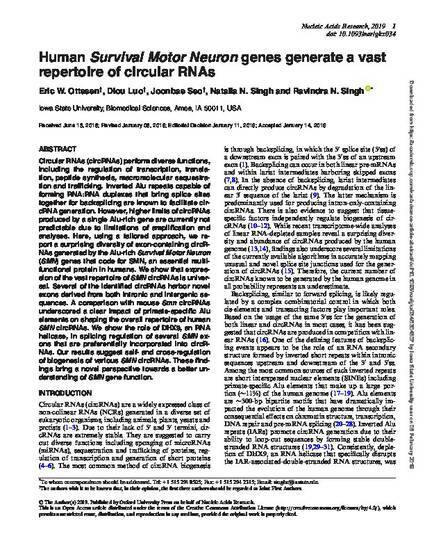 Circular RNAs (circRNAs) perform diverse functions, including the regulation of transcription, translation, peptide synthesis, macromolecular sequestration and trafficking. Inverted Alu repeats capable of forming RNA:RNA duplexes that bring splice sites together for backsplicing are known to facilitate circRNA generation. However, higher limits of circRNAs produced by a single Alu-rich gene are currently not predictable due to limitations of amplification and analyses. Here, using a tailored approach, we report a surprising diversity of exon-containing circRNAs generated by the Alu-rich Survival Motor Neuron (SMN) genes that code for SMN, an essential multifunctional protein in humans. We show that expression of the vast repertoire ofSMN circRNAs is universal. Several of the identified circRNAs harbor novel exons derived from both intronic and intergenic sequences. A comparison with mouse Smn circRNAs underscored a clear impact of primate-specific Alu elements on shaping the overall repertoire of human SMN circRNAs. We show the role of DHX9, an RNA helicase, in splicing regulation of several SMN exons that are preferentially incorporated into circRNAs. Our results suggest self- and cross-regulation of biogenesis of various SMN circRNAs. These findings bring a novel perspective towards a better understanding of SMN gene function. This article is published as Ottesen, Eric W., Diou Luo, Joonbae Seo, Natalia N. Singh, and Ravindra N. Singh. "Human Survival Motor Neuron genes generate a vast repertoire of circular RNAs." Nucleic Acids Research. (2019). DOI: 10.1093/nar/gkz034. Posted with permission.